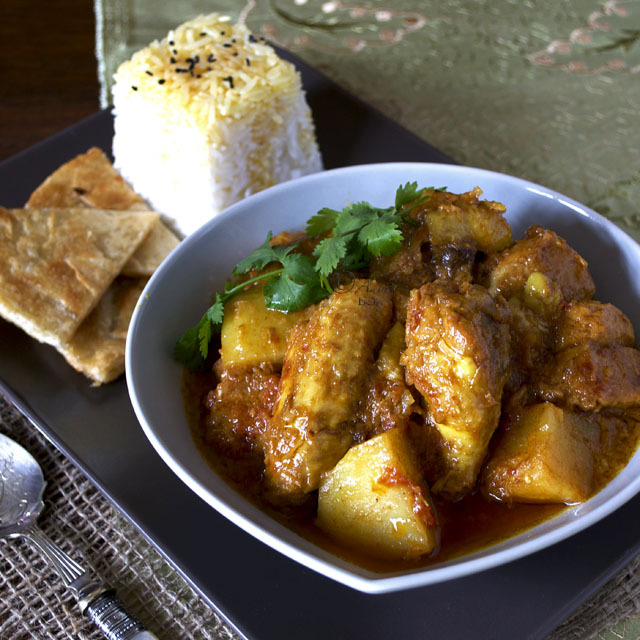 My family love curries, all sorts of curry. Part of the fun of eating it is having all the accompanying breads and poppadoms to dip in the sauce. We can't seem to have enough of crabs. While it's in season, we eat a lot of it. Today, I made a crab and corn chowder. I've left the meat in the shells. 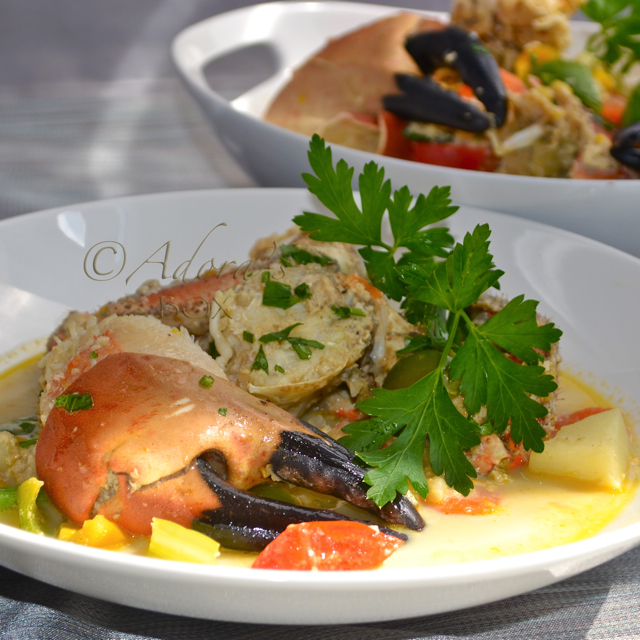 The shells makes the soup taste so rich, briny and really crabby (!). Also, this is supposed to be a quick and easy to cook dish. I don't want to slave all day picking the flesh off the crab shell. Flaked crab meat tends to fall apart when cooked leaving you just mush to chew on rather than the big tasty morsels that you coax off the shell. 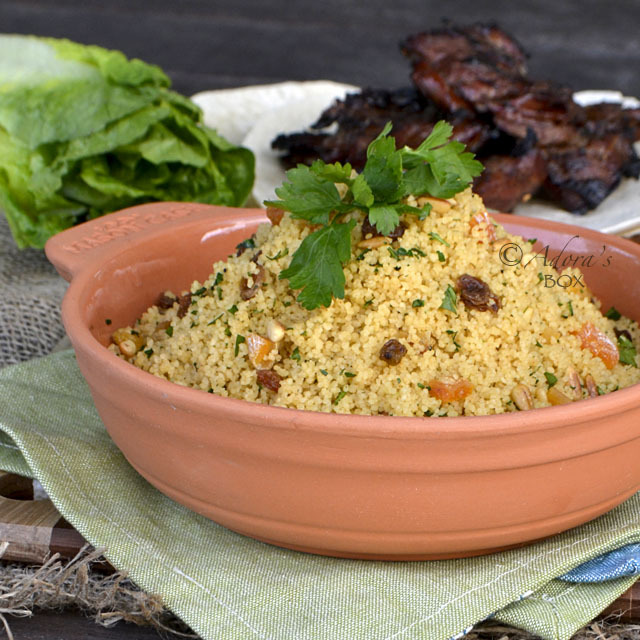 The name of this recipe conjures images of swaying palm fronds and sashaying lasses. 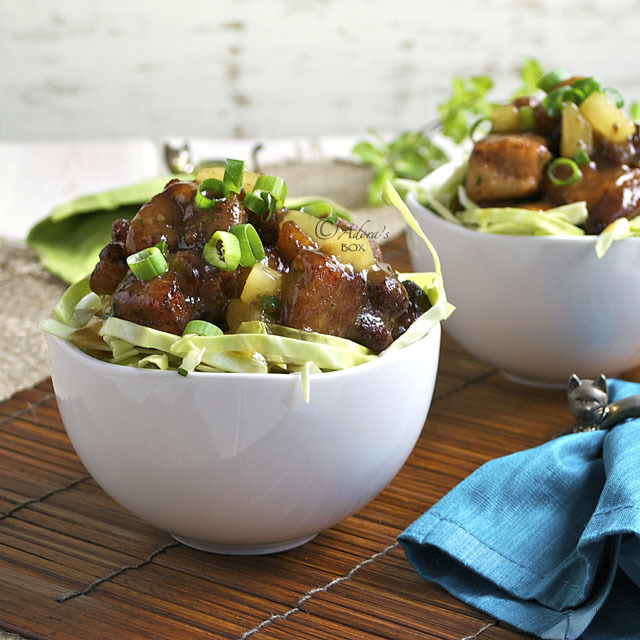 The flavour is a tantalizing mix of Asian and fresh tropical flavours. One taste and you will approve of the name it was aptly given. 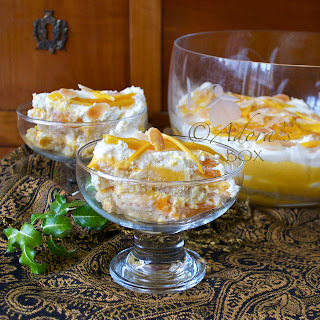 Sans Rival is a classic Filipino dessert which simply means without rival. 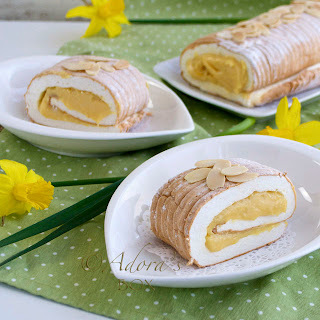 It is unrivaled in decadence because of the amount of butter, eggs and nuts it contains. 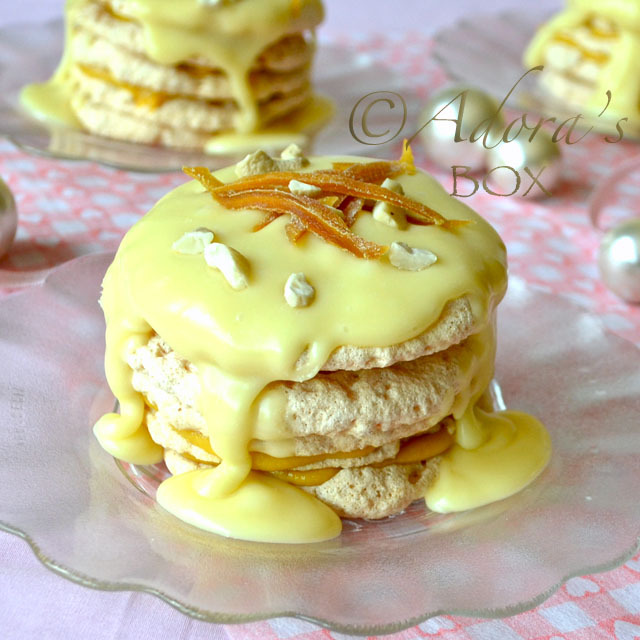 Several layers of meringue with chopped cashews are frosted and filled with cream mousseline (eggyolks, sugar syrup and butter). More chopped nuts pepper the whole cake. 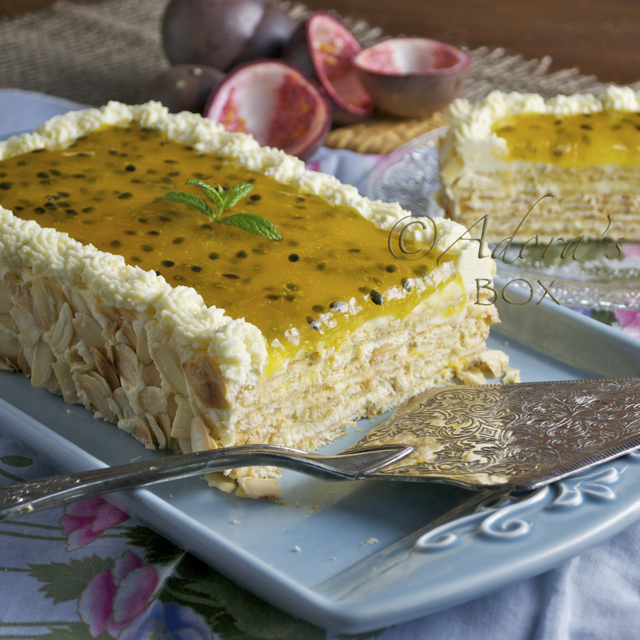 It is truly delicious but too rich and too sweet. 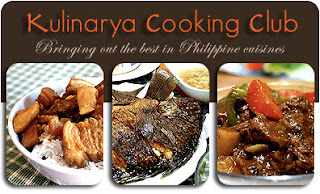 Diona of Tita Flips and I are the hosts this month at the Kulinarya Cooking Club. We have chosen a white theme for the wedding month of June. I have chosen to simplify and deconstruct the elaborate sans rival (nearly destroy also). 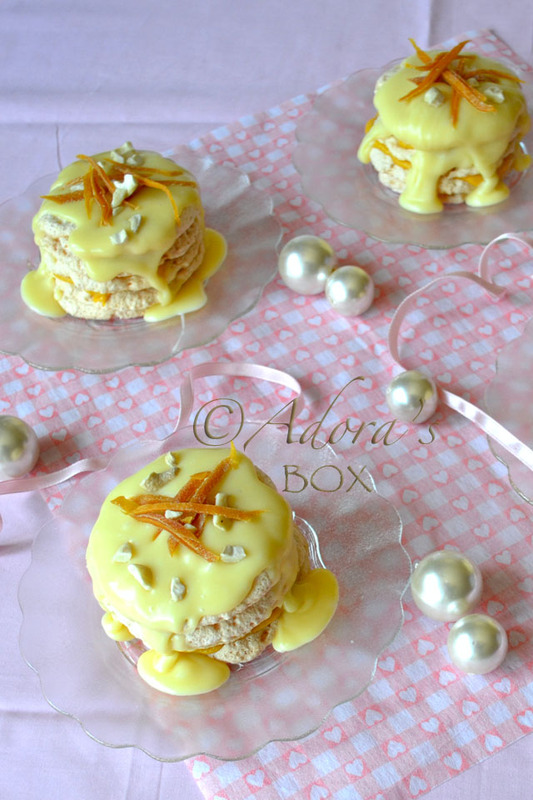 I have made meringue wafers instead of sheets, filled with mango curd and drizzled with white chocolate ganache. They are not as impressive in looks as a big gateau but what they lack in looks is made up for by the taste. 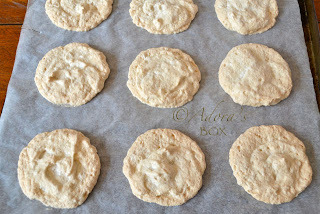 Draw 3" circles on a sheet of paper to make a template for your meringue wafers. Cut sheets of non-stick baking parchment to line your baking sheets with. Put the template in between the baking sheet and baking parchment. You will need about 4 sheets of baking parchment. bag with a plain nozzle. Using the template as a guide, pipe circles on the baking parchment, starting from the edge then going towards the center. Keep the nozzle close to the paper to make thin discs. Pull out the template before putting the pan in the oven and use the template for the rest of the baking parchment sheets. Bake at 230° F/ 110° C for 30 minutes or until crisp and dry. Let the meringue cool down before carefully peeling off the paper. Transfer to a cooling rack. Prepare the filling. I used tinned sweet Alphonso mango purée for this that's why it's darker in colour. 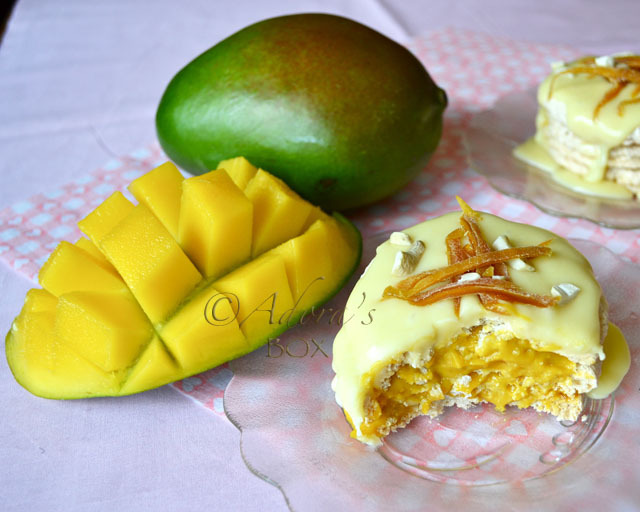 You can puree fresh mangoes. Put the mango purée, sugar and egg yolks in a sauce pan and blend together. Cook on low heat until it boils. Mix the corn flour and flour together and add to the mango mixture while stirring. 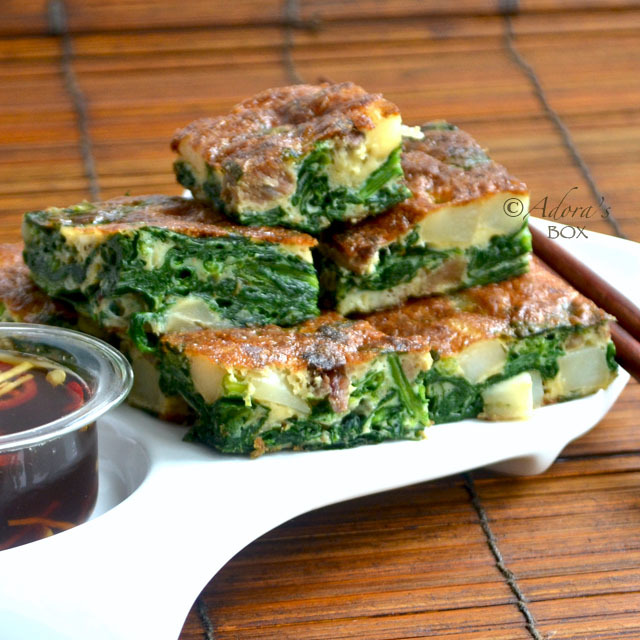 Continue cooking until thick. Transfer to another bowl and set a circle of parchment paper on the surface to prevent skin from forming. Leave to cool, then refrigerate. Chop the white chocolate roughly and transfer to a mixing bowl. Put the cream in a microwaveable container and heat for 45 seconds. Pour over the chocolate and whisk until it melts and the mixture becomes smooth. Leave to cool. 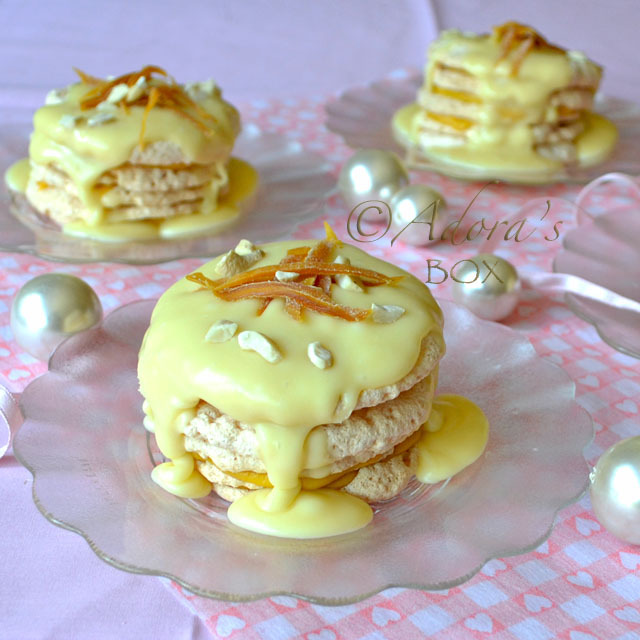 You'll need 5 wafers per mini cake. 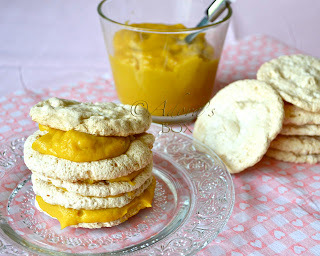 Spread a little bit of mango curd in between the wafers. I put a bit too much. It tastes nice but made the wafers soft. Drizzle with the ganache. Decorate as you like. I used slivers of dried mango and chopped cashews. Refrigerate, then serve chilled. This post is for the KULINARYA COOKING CLUB theme for June 2011: White. See the posts of the other members by visiting their blogs. There are a lot of Filipino dishes which have place names attached to them even if they have no connection to them whatsoever. 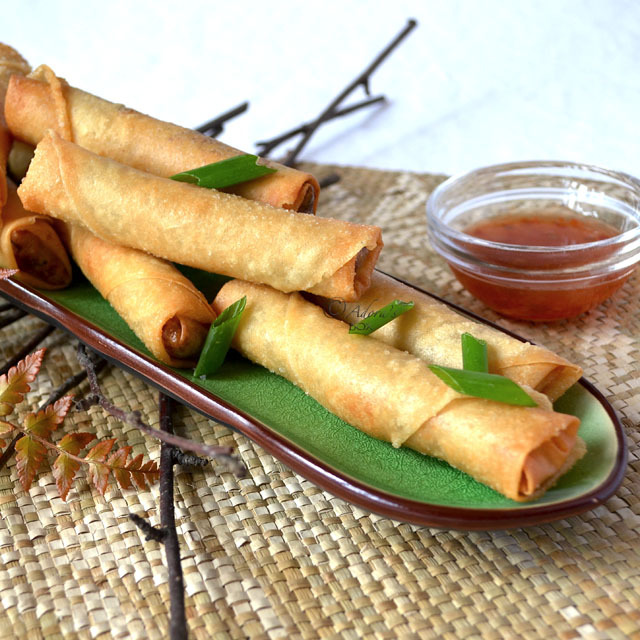 Lumpiang Shanghai is one of such dishes. This dish, although not one of the town's classic fares, was invented in Marikina. It was the innovation of a couple named Henry and Naty Jao who were poultry retailers at the town market. 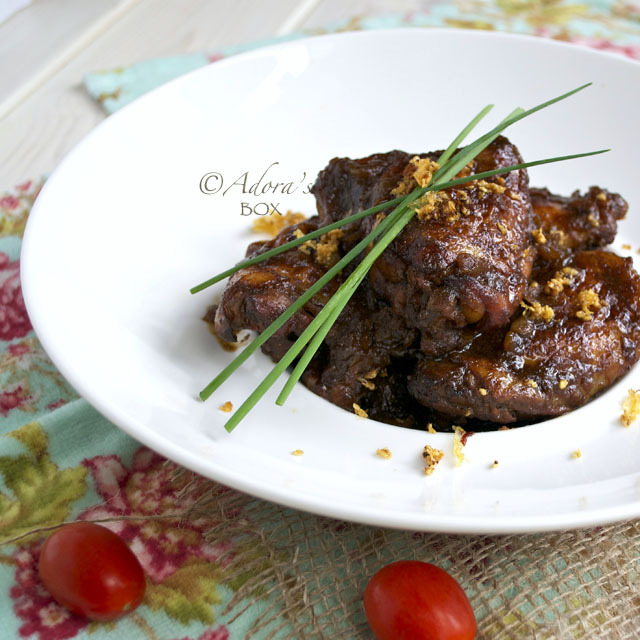 The chicken is mildly flavoured with adobo seasonings then is sautéed with chopped onions and ground chicken liver. Salted eggs can be bought ready prepared. It is sometimes sold in the Oriental shops salted but uncooked. 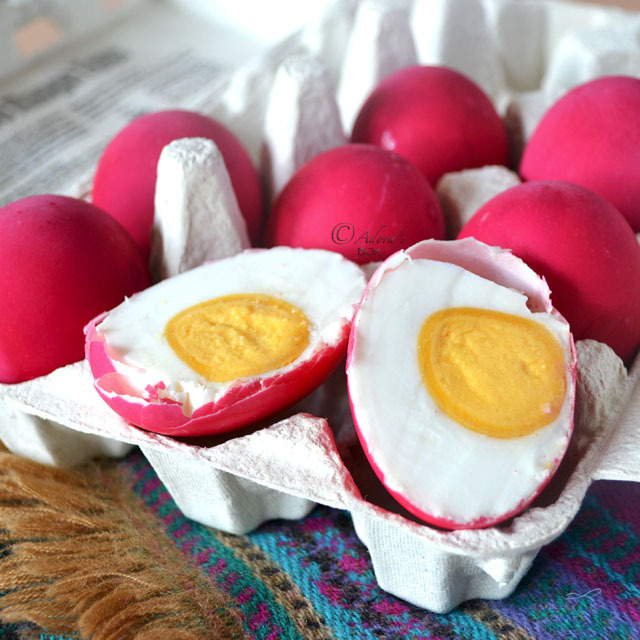 In the Philippines, it is sold already cooked and coloured a very deep pink to differentiate it from chicken eggs. We call it itlog na maalat which simply means salty eggs. An idyllic life for me and my family would probably be living near the sea. 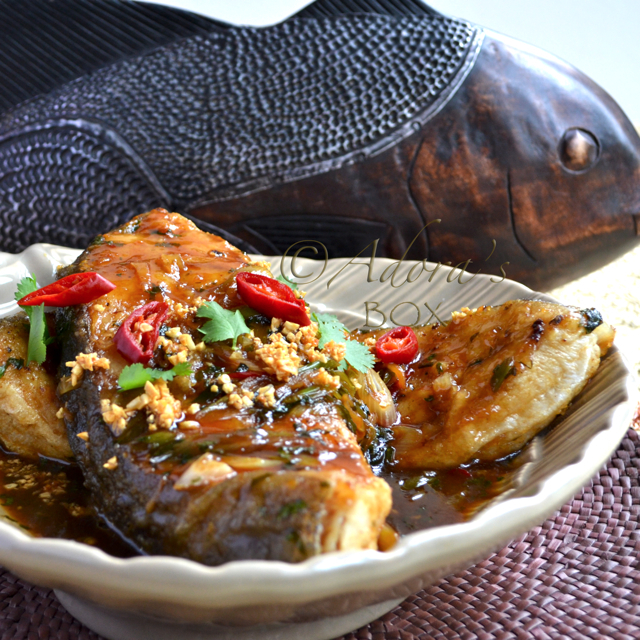 We just love fish and all types of seafood. It is not easy to access fresh fish in London but we are lucky enough to have a few good sources in our area. We eat fish as much as we can, usually at lunch time and always with rice. That, for us, is the perfect combination. 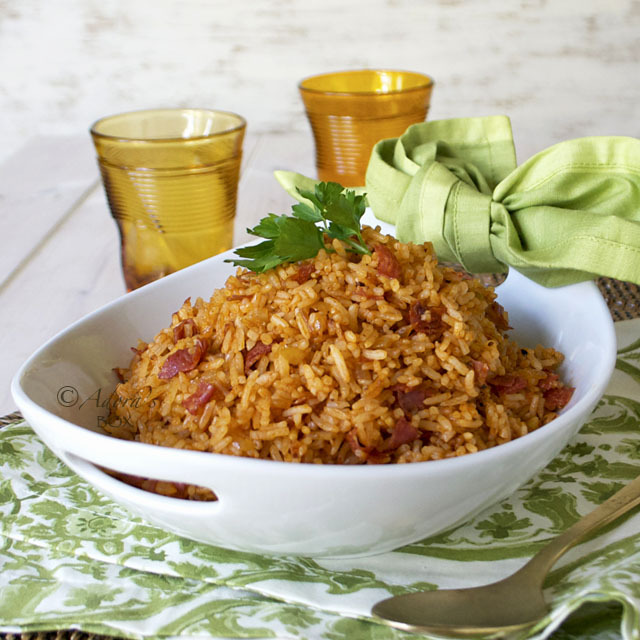 This dish is my version of a very popular rice dish in the Philippines called Java rice. It is in no way connected to the place Java. It was popularized by a restaurant called Aristocrat which is known for their barbecue chicken. 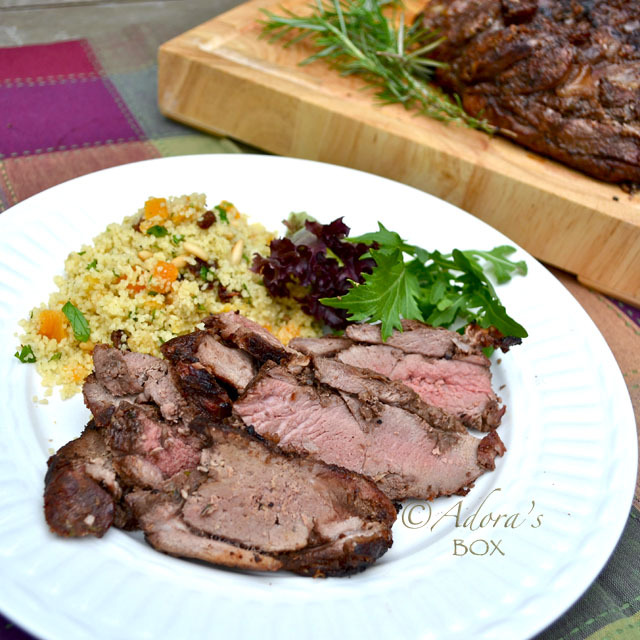 Leg of lamb is a family favourite. We have it twice a year: for my daughter's birthday and for Easter Sunday. It can be rather pricey so it isn't something we eat all the time. When I found that leg of lamb was on offer at the supermarket, I decided to take advantage of it and have an extra this year. Sometime ago, there was a series of television adverts for eggs where they show a nearly empty fridge with just a carton of eggs and one other ingredient such as a sausage or an onion inside. In one of them, a young girl was in such a situation with her Dad, who was a clueless cook. So she then decides to cook the last remnants of food in the fridge and whipped up an omelette (of course). The Dad said, as a form of thanks, "You are like your Mum. You can make something out of nothing."